Fly a space mission beyond your wildest dreams! Participants will work on teams to complete their Rendezvous with Comet Halley mission, while conducting experiments, monitoring life support, and implementing navigation orders. In this dynamic environment, principles of science, mathematics, and technology will be utilized to complete tasks. Work towards your Girl Scout Journey and visit StarLab, our portable planetarium! Scouts act as astronauts and mission controllers as they fly a simulated mission. This program allows scouts to become engineers, designing and testing their own water filtration and thermal protection system. Saturdays only. 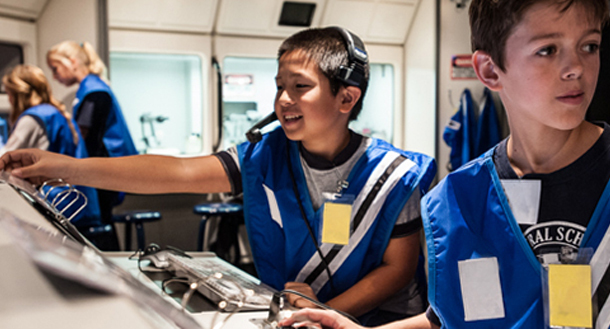 Scouts experience the thrill of being an astronaut and fly a simulated mini-mission. This program is designed to teach scouts about conservation and energy by completing a design challenge to construct an energy efficient space station. This program is designed to teach scouts about the wonderful world of water through experiments with conservation, filtration, and hydroponics. Experience a lift-off in our launch simulator. Sci-Trys also available. Snack provided. Earn a Belt Loop & Science Pin, and visit StarLab, our portable planetarium! This program is designed for Cub Scouts. Work towards the Astronomy Belt Loop and Pin. Let us introduce the wonders of science to your den! Snack provided.